Hey everyone! Is it officially time to start making Christmas cards yet? I’ve been making mine since mid-Summer, but I wonder when everyone else usually starts. 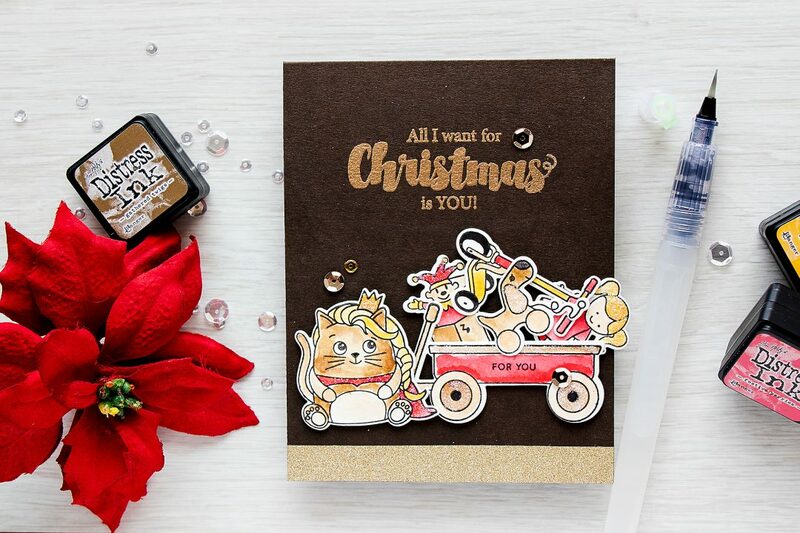 Here’s a card I made using a few stamp sets from Simon’s STAMPtember 2016 collection – I combined Christmas Toys with the Critter Costumer Party set. The little blonde critter here is me, lol! 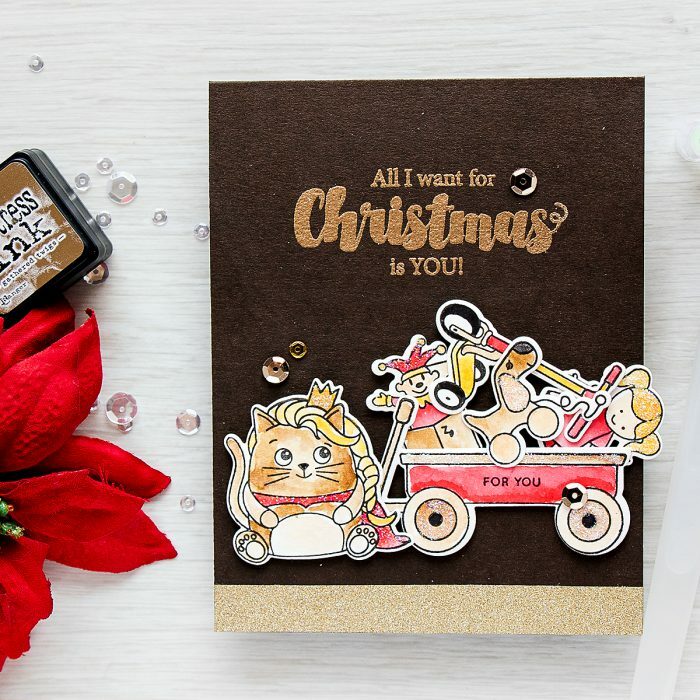 This is a card for my hubby and I’m saying “All I want for Christmas is YOU!”, I have my toys (read “cardmaking supplies”), but I just want you. Of course this is probably not the first or last card I’ll make for him for this Christmas, he loves them and appreciates them and that just makes me happy (and eager to make more). I used chocolate brown card base here and heat embossed my sentiment directly onto the card using Antique Gold embossing powder. Images were stamped in Simon’s Intense Black ink and watercolored with Distress (I’m listing colors below). I cut them out using coordinating dies and arranged into a little scene on my card. 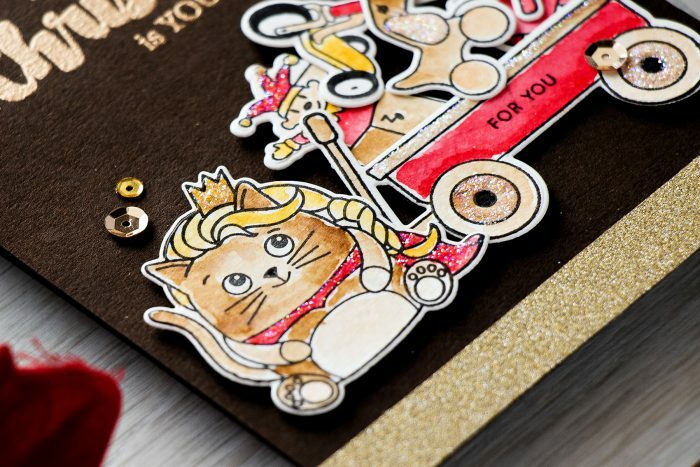 I used stickles and added a bit of glitter glue to accent these images – cape and also crown on the critter, inner part of the wheels etc. This is a simple card to make and is sure to make to recipient smile. So when do you start making your Christmas cards? Or do you have them all done by now? Aw, Yana, what a sweet card!A very nice job on it. Adorable Christmas card Yana ! I’m always very late doing my Christmas cards, and I think this year it will be the same ! Thanks for sharing. Sometimes I can start holiday cardmaking in January lol. But usually try to slowly start in mid-summer. So I have enough if them when holiday season starts. And season is usually pretty busy, less time for cardmaking. 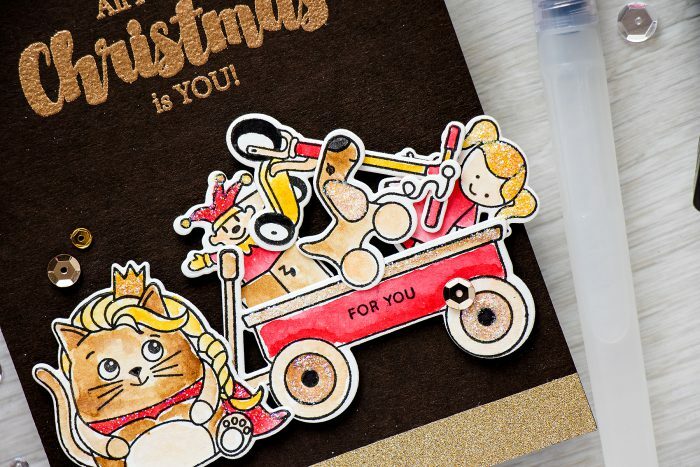 Your card is so sweet and cute! Love coloring and design.